Safe and Sound Piano has enjoyed a long relationship with many of the local music teaching organizations including the East Valley Music Teachers Association, Desert Valley Music Teachers Association, and the Arizona Music Educators Association. Every year about this time we have the privilege of helping several of these organizations hold large events using 15-25 pianos with two students on each piano. It’s quite the feat not just from the logistical point of view (providing, tuning, and delivering 20 grand pianos! 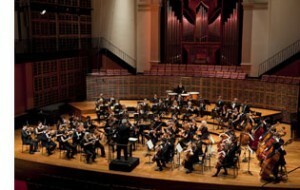 ), but it’s also a great accomplishment for students to learn how to perform in an ensemble setting. The first of two of these events just took place this past weekend. We were able to provide 13 baby grand pianos and 2 upright pianos for the event which took place at a local high school. We spent the week leading up to the event rounding up the right high end pianos and getting them tuned and ready for such an important event. On Friday we assembled our A-team to load and deliver all the instruments. Even with the unexpected rain the whole process went swimmingly. 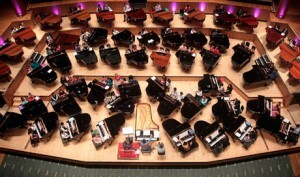 The next event is coming up at the end of February and it requires 25 pianos! Can’t wait! It’s such an honor to serve such great people in our community and to get to see such unique events take place in our city.